Jeff Goins, a brilliant new voice counting Seth Godin and Jon Acuff among his fans, explains how to abandon the status quo and live a life that matters with true passion and purpose. This book sat on my Kindle for almost a year before I read it. I wish I had not waited that long to start it. I heard Jeff Goins speak, and met him briefly, several years ago at a conference. I really enjoyed hearing him speak. 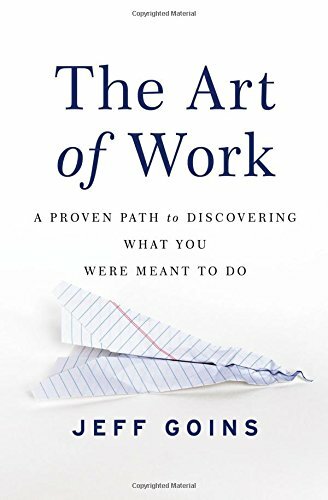 When I saw his book, The Art of Work, I knew I needed to add it to my reading list. One of the reasons it took me so long to read this books is that I was afraid that it would be like so many other books that I had read recently on finding your dream job. The reality is that all jobs are work, even dream jobs. When you do something you love for 40+ hours a week, it won’t always be the dream you hoped it would be. Yet, so many people are writing about finding the dream and how wonderful it is. This book had some of that, but it was in a much more realistic sense. Jeff Goins told stories, shared experiences, related it to real life. Finding the dream is often not what most of us start out thinking it will be. Finding your dream and what you are called to be is a process and journey that is often difficult and full of failures. But if it is what you are meant to do it will all be worth it. One of the other things that I loved about this book was discovering that I knew one of the people he interviewed for the book. It was a fun surprise to be reading and all of the sudden realize that I recognized the person he was talking about. This is a book many will enjoy, I think this book would be especially great for a high school or college student.